There are so many opportunities for improving your facility wide compressed air distribution system that it can boggle the mind. And if you have begun to look into improving your compressed air efficiency, either on your own or with a consultant, it can be overwhelming. There are things you can concentrate upon which will bring measurable results and quick efficiency gains without having to know all there is to know about compressed air generation and efficiency or without breaking your annual budget. Many times, the hierarchy of making improvements in your compressed air system will begin with the larger equipment. If your compressor is outdated, inefficient or sized improperly for your plant, the cost of replacing it may scare you away from proceeding down the efficiency path. It is also typical to first concentrate on updating the controls of a compressor to best match peak demands and lulls in the need for air and, while this is a very good step to take in your overall plan of attack, it can also burden your budget. Making improvements to auxiliary equipment like dryers and cooling equipment will also improve the overall efficiency of your system but can also come at a significant cost if replacing the equipment is necessary. Furthermore, upgrading your piping system can reduce pressure drops and improve delivery of the compressed air dramatically if you have the time and capital needed to replace your delivery system. If you are serious about improving your compressed air efficiency, all of these factors should be addressed and will show great gains in achieving your efficiency goals. It is also possible to make significant gains in efficiency by working backwards in the typical hierarchy of compressed air efficiency. You may find that there are more economical ways of meeting end use needs by looking at the efficiency of end use products before conquering the distribution system and controls. Working in this way places much of the success of your program on your operators, maintenance personnel and managers. It is an opportunity for a population of people within your organization to recognize, conceive and implement a program of action which will pay quick dividends. These less discussed implementations typically come at a lower cost and time investment. Someone at your facility will know where to begin looking for savings opportunities. A particular leg of your system or a process within your production probably has a reputation of using a lot of air, and raising production costs. When working on these smaller legs of the entire system, a baseline is still necessary in order to determine future gains in your efficiency. A simple flow meter placed on the supply line of a specific leg of your system will provide you the starting value to begin optimizing this leg of your system. You will also gain a perspective on how much air out of your entire system you are dedicating to this specific leg or process. You may immediately recognize savings opportunities if, when this leg is shut down, you are still registering some air flow on your flow meter which is a clear indication of compressed air leaks. A Digital Flowmeter can be used to help you monitor your compressed air usage and identify costly leaks or inefficient air products. It will be important and useful to invest in an Ultrasonic Leak Detector for identifying these leaks, if they are not already obvious. Leak detectors can help you locate and mark the specific location of each leak you deem large enough to fix. Simply marking these leaks for maintenance will put you far ahead of most facility optimization programs, but actually fixing them is the goal. Keep your eyes open for push in fittings and quick disconnects which are notorious for leaking. Of course you will also find some valves and pipe fittings in need of repair or tightening as well. Leaks can account for as much as 30% of compressed air consumption and can quickly provide payback when addressed properly. Over time, every little process or individual leg of a larger system develops its own set of unique fixes and solutions in order to keep the process running smoothly. Many end-use compressed air fixes come in the form of an open pipe or tube that blows air to keep a box flap down, to clean a part surface or to reject a part from the process. These quick fixes should be addressed by implementing some engineered compressed air products which can reduce air consumption and noise levels while increasing operator safety with minimal investment. A major North American bakery has been working on specific legs, one at a time, of their production process to reduce compressed air consumption throughout their plant. This specific example used a home-made compressed air nozzle to de-pan rolls from their baking pans. They had fabricated their own nozzle by capping off a 3/8" pipe and drilling a 9/64" hole in the cap. Running at 80 PSIG this "nozzle" consumed 25.4 SCFM. When retrofitting the pipe to use an engineered air nozzle, the result was 17 SCFM at 80 PSIG, a clear savings of 8.4 SCFM. There were ten nozzles used for removing rolls from the pans and it was a two shift per day operation. The following savings calculation is for one production line; in many facilities there will be more and more opportunities for savings on additional lines. Using the average compressed air cost of $0.25/1000 ft3 we can further quantify the savings. The total investment for the engineered compressed air nozzles (EXAIR Model 1100 Super Air Nozzle) was $310.00, for a simple ROI of 16 days. The force value of the home-made “nozzle” was 1.04 pounds at 80 PSIG. The air amplification characteristic of the engineered air nozzle allowed for a significant reduction in compressed air consumption while still being able to maintain a force value of 1 pound at 80 PSIG inlet pressure. EXAIR’s PEEK Super Air Nozzles deliver strong blowing force while providing non-marring protection. Engineered air nozzles reduce noise levels and air costs. Beyond local measurement of compressed air flow, locating and fixing leaks, and upgrading your end use methods, there are a few more areas available to improve upon. Make certain to outfit any application using compressed air with some kind of control to turn the air off when not in use. A sensor to see a part which needs to have liquid removed can activate a solenoid valve or your machine controls could be programmed to open a valve only when the machine is in operation. Many production processes stop at break time or lunch time. Are you also shutting off the air supply to the machine or does air continue to blow through lunch? 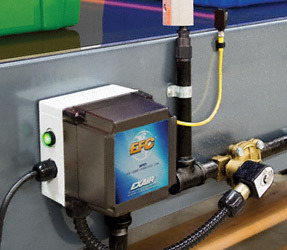 EXAIR’s Electronic Flow Control minimizes compressed air use for blow off, drying, cooling, conveying and static elimination operations by turning off the air when no part is present. For applications of high air demand which are intermittent, intermediate storage can be a solution. A receiver tank positioned to supply the application’s demand will prevent a pressure loss to the whole system. Maintaining pressure will insure the rest of your applications are running properly and could prevent you from turning up system pressure or keep you from considering another compressor to satisfy one application. And lastly, pay attention to the needs of your application. You may find that you can get the job done with much less pressure than full system pressure. Installing a pressure gauge at an application will allow you to fine tune the application for success at the lowest pressure possible. Lower operating pressure also lowers air consumption. Keep these achievable goals in mind when the subject of compressed air reduction is addressed at your plant. The savings are measurable and valuable to any plant with a compressed air system. Beginning at the end use side of a compressed air system could allow you to realize enough savings to upgrade the more expensive elements of your system like auxiliary equipment, controls and compressor upgrades.